Door Clearance Center is one part showroom/warehouse, one part treasure hunt. Everywhere you look, though, Door Clearance Center is wall-to-wall bargains on doors in a multitude of styles and materials: Mahogany, Walnut, Knotty Alder, Fiberglass, Steel – all assembled here in Texas and starting at $99, pre-hung and ready to go. Because it’s a clearance center, you’ll also find one-of-a-kind treasures. It’s worth a trip just for ideas. It’s also worth a trip to their location at Gulf Bank and the North Freeway to give your home a fresh new curb appeal at a clearance center price. While at Door Clearance Center, check out their door jamb and door reinforcement items to deter kick-ins and break-ins. Ask them to show where these products actually prevented a break-in right there at the store. 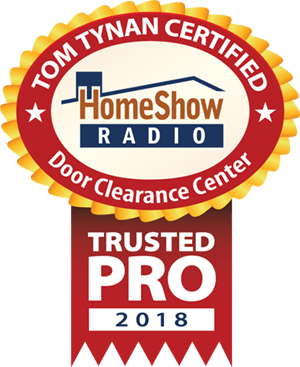 Serving the Greater Houston area, Door Clearance Center is a trusted HomeShow Pro, certified by HomeShow Radio’s Tom Tynan. How can the Door Clearance Center help you? • Make a better impression and make your home more secure with one easy fix. • How vulnerable are you to a door kick in? The facts are shocking.